Care home exhibitions 2017 are a fantastic way for care home workers to find out more about the industry, discover new technology which may be beneficial to their workplace, and ultimately, give them more of an insight to the job that they love so much. Care homes are an important part of society. Those who work in care homes are the ones who take care of others, and thus it’s important that they are trained properly and that they know as much as possible about the care home where they work, as well as knowing how to care for the care home residents. If you’re someone who works in a care home or represents one, then take a look around our website to find out when our next exhibition is near you. After attending your first care home exhibition, you’ll truly understand how beneficial they can be to all care home workers across the UK. On top of being a very informative experience, there are several other reasons for attending a 2017 care home exhibition. We have trained experts who will be able to answer any of the questions that you have. Meet new people and connect with others who work in the care home business. All of our care home exhibitions are free so that you can get all of your information in one place, without spending a penny. We host care home exhibitions all across the UK. Regardless of where you live, there will be an exhibition nearby. 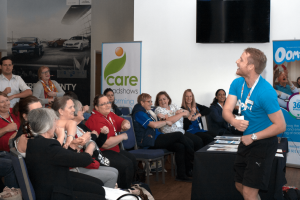 Attend some of the workshops which are hosted within these exhibitions which are run by an expert in the care industry who takes a hands-on approach. Each of our exhibitions are unique and we try to take a different approach to each of them so that those who have been before, get a different experience. These are some of the big reasons for attending a care home exhibition in 2017 although above all, with consideration to the fact that all of our exhibitions are completely free, there really are no reasons for you not to give them a shot. If you work in the care home business and you want to learn more, then attending one of our care home exhibitions is a fantastic opportunity which is worth taking the time to attend. We are looking for speakers to take part in our educational seminar and interactive workshop programmes. If you would be interested in speaking at one of our care home exhibitions 2017, then please submit a proposal form. Care home events can be incredibly informative and interesting, especially for those who work in the care home industry. For that reason, we write regular newsletters to which we fill with lots of information regarding our events, and generally any new information that we can provide our readers with in regards to care home. Much like the events which we host, our newsletters are informative and worth taking the time to read. Simply click on the “Subscribe to Newsletter” button located at the top of our website, enter your email address and name, and we’ll add you to our mailing list where you’ll be sent everything that you’ll ever need to know about care home exhibitions 2017. We understand the importance of the care home industry and we have been working within this industry for years. When it comes to care home exhibitions 2017, we are the best around. If we’ve piqued your interest and you’re looking to get involved or attend one of our events, then get in touch with us today and we can help you out. Give us a call on 01425 838393, or send us an email at [email protected], and we’ll help you the best that we can.